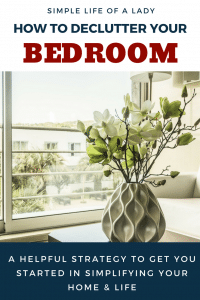 Em Mendoza 2 Comments on How to Declutter Your Bedroom in an Easy, Energizing and Fun Way for Just 15 Minutes a Day! Are you a messy person? Have you almost given up on organizing? If so, this could be just the right information to help you start organizing your things. Do you know that 15 minutes daily is all it takes to make a difference? It may not be that much at first, but once you are consistent with it, you will see results soon enough. When I was in high school, my mom would always describe my bedroom as topsy-turvy. I would feel irritated whenever she would point that out. But I couldn’t blame her, because my room was really full of clutter… everywhere. It didn’t look like a bedroom. It was more like a storage room. It’s been more than a decade since high school. Many things have changed in my room… except for the clutter. It should look like a lady’s bedroom now, but it still looked like a messy storage room. It’s not that I want clutter, or that clutter is just fine with me. I also prefer my things to be in order. But I just couldn’t get myself to be really organized. I get overwhelmed by it. And I just have too many things to do. Organizing… decluttering… cleaning… this group of activities has been a burden to me ever since I can remember. I can’t keep going on like this forever. I hate to be like this forever! If there’s one thing I’m committed to changing this year, that’s becoming organized. But how? How am I supposed to be an organized person when keeping things in order overwhelms me? I kept asking myself why… why does organizing overwhelm me? My reasons were: it takes me a lot of time (more than a day), it drains my energy, and it’s not fun! So if I had to change, I had to do it where it won’t take me a lot of time, where it won’t drain my energy, and where it would be fun. What if I could declutter regularly, for just 15 minutes a day? I remembered Gretchen Rubin’s book on Habit that I purchased a year ago. She emphasized that not every strategy works for everyone. There is no one-size-fits-all. Applying it to my organization problem, if I were to see the change that I want to happen, I have to find the right mix of strategies that will make decluttering easy, energizing, and of course, fun! Fun – the idea that decluttering my room is easy, and will just take 15 minutes – this is already fun in itself! I felt so excited about this idea that I wanted to start decluttering immediately! I wanted to find out as soon as possible if this 15-minute decluttering strategy I was thinking would indeed work for me. Before I started, I remembered that every successful endeavor starts with a strong why, whether it’s as complicated as starting a new business, or just as simple as decluttering a room. For this strategy to work out, I have to remember my whys. Why do I want to be an organized person? Why do I need this change so badly? Why am I starting (and aiming to maintain) a 15-minute daily decluttering strategy? Let me share them to you. To keep me sane whenever I’m looking for something. This is the most important because clutter has really given me a lot of headaches in the past. You know the feeling when you can’t find your keys, or the list you just made, or the books you want to read, or the envelope that you need right away, or the files you have to check. Locating them, and many other things, just drive me nuts! The thing is that I’ve been so used to this situation that to me, it’s the norm. It’s part of my busy lifestyle. But just imagine what a relief it is when you can easily locate what you need. To free myself from unnecessary stress. When I see a clutter, I feel like I’m handling all of it. I may not be holding the things physically, they’re just there, untouched, but in my mind, it’s there and I notice it. Also, I can only handle a few clutter in my mind. So when there’s too much, it easily adds up to the stress of the day. I feel like before the day ends, I have to get them organized. It is much easier to organize things when you have less. I have a small room. But I do believe that it’s just the right size for me. The problem is that I have accumulated a lot of things for many years. They have piled up. But many of these I don’t actually need or use anymore. I love simplicity! I don’t need a lot of cool stuffs to be able to work. If you love simplicity too, you will agree with me when I say that simple people often need fewer things. But these things are the essentials. This is how it works for me. As long as I’ve got what I need, I’m good to go. To reflect the God I worship. I’ve always claimed that I believe in God. But I have a very disorganized room. Every woman who believes in God knows that it is her responsibility to reflect the qualities of her Lord. Anyone who would enter my room wouldn’t believe that I worship God. Because God is orderly. But my room is messy and chaotic. I want my life to reflect God’s qualities, and I believe that includes the way I manage my private room. Okay, so those are my reasons… my whys. 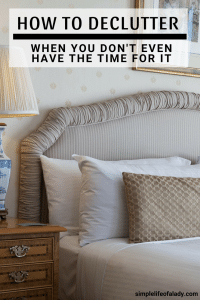 If you have read this far, then I guess you can relate to my story, and you also want a decluttered and organized bedroom. You just don’t know how to do it without being overwhelmed. But before you jump in to try if this method works for you too, be clear first with why you are doing this. Believe me… it does help to keep you going. I’ve prepared a printable guide to accompany this article. The First Part of that is reserved for your reasons for decluttering. You can download it here for free. It’s absolutely no cost to you. Now let me continue my story. The following day, I was ready to start my new project – decluttering my bedroom for only 15 minutes a day. I took out a piece of paper and documented what I was doing with everything I got to touch. TRANSFER. Everything that are functioning, in good condition and can still be used, but don’t necessarily belong in my room, I classified to this category. It’s either the thing goes to my brother’s bedroom, to the kitchen, to the living room, in the garage, or in the storage room. KEEP. This is where I classify those that I regularly use. If I’m not yet using them now, I’m very sure I’ll be using them in the next few weeks or months. These items need to be properly kept so that these don’t look like clutter. RECYCLE/UPCYCLE. I am not a fan of mindlessly trashing things just because the stuff has done its job and I don’t need it anymore. I believe everything around us can be recycled or upcycled. So I have a box where I store these things. Just the idea of recycling all these excites me! If you’re not a fan of recycling or upcycling, there are people who are, and would love to have what you would willingly throw away. You can box these items and give it to them instead of mindlessly throwing them. SELL/GIVE/DONATE. I have lots of things here that are still in good condition, some have not even been used yet. The twist is that, I’m sure I won’t be using them anymore. But someone else may be interested. NEEDS IMMEDIATE ACTION. 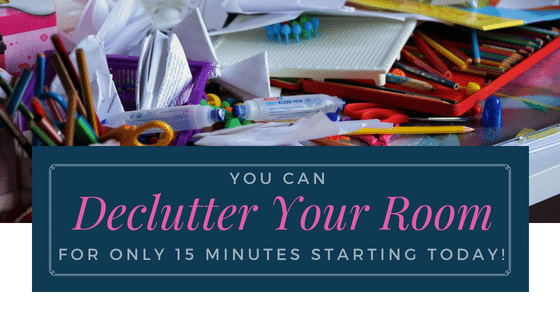 When I started this I discovered that sometimes 15 minutes is not enough to conquer a group of clutter. So if I find a group of clutter that’s hard for me to handle in the allotted 15-minute time, I put it in a box, and transfer it to the living room. Then whenever I’m vacant during the day, or when I’m done with my tasks, I pay attention to this box and classify every item that is in there. This takes more than 15 minutes every time. But it’s okay as I get to really pay attention to these things. Sometimes I am unable to manage this during the day. So what I do is I do it the following day, before I start the 15-minute decluttering activity. This way, these items do not get to pile up in the living room. TRASH. This can be any item that cannot be recycled or upcycled anymore. So all items that do not belong on the above classifications end here. Examples: Spoiled food and ingredients, plastics, papers, you name it. So that’s how I classify every item in my bedroom. Feel free to try those too! And I would love to hear your feedback on that. Now here comes the more challenging part… maintaining the 15-minute declutter habit. Fifteen minutes is quick and it’s really easy. But the question is, how many days will it take you to fully declutter your room? You might find that it takes longer. Waaaaaaaayyy longer, than just a day or a week. If you are in a hurry to declutter your room and get yourself organized, you might find yourself weary and dissatisfied with the process and the limited amount of achievement you can have each day. So if you are in a hurry, this might not be the best method for you. 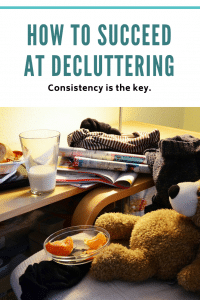 But if you are not, and you find it more important to build the decluttering habit than how your room will look like seven days from now, then this might just work well with you. You may find it easy to start a habit. On Day 1 you’ll feel very excited. Then you’ll find out on Day 5 that it’s no longer as exciting as Day 1. If you’re like me, if it’s not exciting anymore, you lose your motivation. You lose your drive. You give up. And the habit is not built. Another, if it fails to give you your desired result in your expected time of completion, you may also lose interest and give up. And again, the habit is not built. This is why I asked you a while ago to jot down your reasons for decluttering. It really helps when you know why you do what you do. Building a habit doesn’t happen overnight. It takes time. Studies show that it takes 21 days to build a habit. In my experience it takes longer. Yours may take longer too. But you are not in a hurry, right? As of this writing, my room is not yet as decluttered as I envisioned it to be, not yet as organized as I want it to be. But what is important is that I am getting there, and I am getting better at it, every single day. So if you think this is for you, do not be discouraged if you feel like it takes you too long to declutter and get your room organized. And stop comparing yourself to your mom, to your sister or to your friends that can do it in just a day or two. You are different from them. And again, there’s no one-size-fits-all solution. It’s okay if their decluttering method doesn’t work for you. Because if you’re a marathoner (a person who likes a slow and steady pacing, like yours truly), this 15-minute strategy might just work this time. Now it’s your turn to try it! And if this works for you, don’t limit this strategy in the bedroom only. Decluttering doesn’t stop when your bedroom is clear. It is just the start. Apply this method to finally declutter your entire home. I have prepared a monitoring guide for you which you can download for FREE. I call it 15-Minute Daily Declutter Diary. This helps me track my progress as I build on my daily decluttering habit. If you haven’t downloaded it yet, you can get it here. If you need a little help determining which items you can declutter from your bedroom, here is a list of 101 items that you can purge. Download it also for FREE. If you found this article helpful, kindly take a second to share the love and PIN it. Sure thing Cheri; give it a try! I’d also love it if you could share your experience about it. Feel free to comment again. Or if you want it to be private, you can directly email me.